With the use of World Machine, it’s extremely easy for us to create a big, realistic landscape inside UE4 (Unreal Engine 4). World Machine is a software that allows you to create height maps which you can import into UE4 and use as the landscape for your game. World Machine has many functions that make it easy for us to create extremely realistic terrains, without actually knowing much about the geographic specs of terrain. The tools provided by World Machine are easy to use, simple, and extremely strong. World machine can be downloaded using this link (You should be able to download a trial from their website). Follow the instructions and install WM (World Machine). Note: I won’t go into details about the interface as this is out of the scope of this post. If you wish to know further about WM, tell me in the comments. First, we’ll take a look at how I managed to create the height map and the slope map that you see beneath. These maps were created by combining various components in WM, and exporting the output that we receive. Let’s take a look at the components I use. As you can see, I have a Slopemap and a Heightmap. The heightmap defines the height of the landscape and the slopemap defines the sharp slopes. (We will use the slopemap for texturing later on). Let’s take a look at how I managed to create these two maps with World Machine. 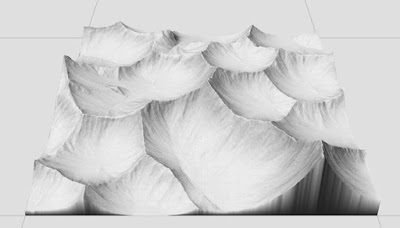 In the image above you can see the two components Voronoi and Erosion. 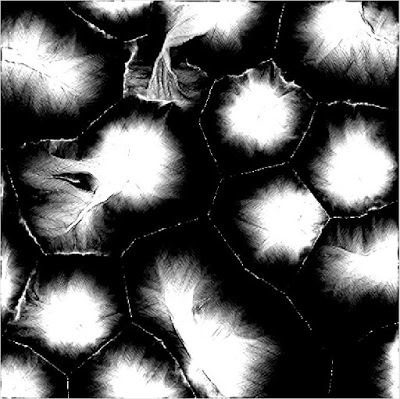 Voronoi is the component that creates random but very neat mountains. You can add this component by going to the Generator tab within WM. (If you can’t find the Device View you can press F5). Play around with the settings of the Voronoi until you see something that looks nice. Notice how the Height Field (Primary Output) of the Voronoi is connected to the Height Field (Primary input) of the Erosion. Basically you take last thing that effected the Heightmap, and plug it into the next component, just like the image above. When you’ve found something that looks interesting, and suits your needs, we can go to the next phase of the WM Heightmap generation. Now that we managed to create the desired landscape, we need to save the heightmap and the slopemap values, so that we can import these into UE4. 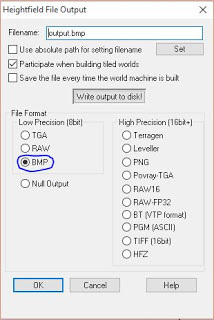 Heightmaps needs to be saved as .raw16, and the slopemap needs to be saved as a .bmp. 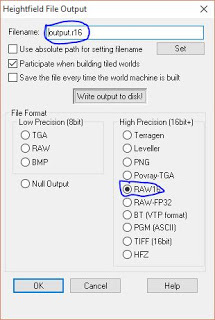 Make sure to choose the RAW16 from the right. Give the file an appropriate name, and press Set. Here, simply place the file where ever you wish. DON’T press Write output to disk just yet, we still have a few options to change. Now that we have the heightmap, we need the slopemap. As mentioned before, the slopemap will define the texturing of the landscape (I tend to use slopes instead of heights, but you can use what ever you desire). To find the Select Slope go to the Selector tab. From here select the 2nd option; Slope. (If you’d rather use the height, simply choose the 1st option; Height). Now take the last thing that affected your heightmap (Still, the Erosion) and place that value into the Primary Input of the Select Slope. If you Double-Click the Select Slope, you can tweak the settings to the desired slope amount. Play around with these until your slopemap looks desirable. Now do the same as you did with the Height Output. (You can simply Copy-Paste the existing Height Output). And congratulations! You have just created the two information images that we need to import into UE4, to create our landscape. 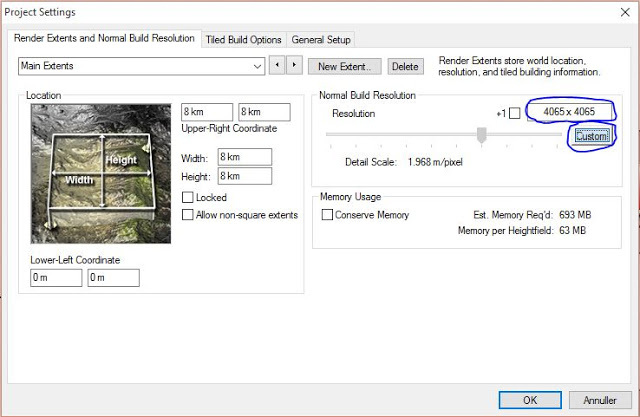 Note: the bigger the resolution you choose, the longer it’ll take to build your World Machine terrain. I’ve created a more complex terrain (refer to image below) and this takes approximately 30 minutes. 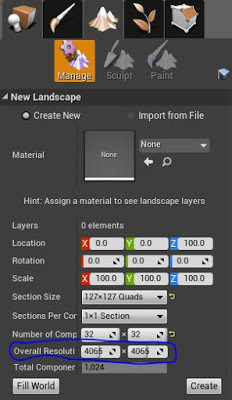 So make sure to plan your landscape size within UE4, before building the WM landscape so you don’t need to build multiple times. Note: Sometimes you’ll need to check the terrain within UE4 to make sure the terrain looks ok. More on that in Part II. Now press the big green button in the menu aaaaand TAADAAAAH. Now you can double-click those two Height Output and press Write to disk! Next time we’ll import these images into UE4 to create our landscape! If you have any question concerning how to use World Machine, please don’t be afraid to comment below and I’ll do my best to answer you. If you wish to learn more about World Machine, check out their website at http://www.world-machine.com, or tell me in the comment if you wish to see a post specific for World Machine. Thanks for reading, and I’ll talk to you guys next time! Posted in Unreal Engine Landscapes.Tagged landscapes, unreal engine 4, world machine.